listen); French: Berne [bɛʁn]; Italian: Berna [ˈbɛrna]; Romansh: Berna [ˈbɛrnə]; Berndeutsch/Bärndütsch (Bernese German): Bärn [b̥æːrn]) is the Bundesstadt (federal city, de facto capital) of Switzerland, and, with a population of 137,980 (end of 2013), is the fourth most populous city in Switzerland. The Bern agglomeration, which includes 36 municipalities, has a population of 328,616 in 2000. The metropolitan area had a population of 660,000 in 2000. Bern is also the capital of the Canton of Bern, the second most populous of Switzerland's cantons. No archaeological evidence that indicates a settlement on the site of today′s city centre prior to the 12th century has been found so far. In antiquity, a Celtic oppidum stood on the "Engehalbinsel" north of Bern, fortified since the 2nd century BC (late La Tène period), thought to be one of the twelve oppida of the Helvetii mentioned by Caesar. During the Roman era, there was a Gallo-Roman vicus on the same site. The Bern zinc tablet has the name Brenodor "dwelling of Breno". In the Early Middle Ages, there was a settlement in Bümpliz, now a city district of Bern, some 4 km (2 mi) from the medieval city. In 1353 Bern joined the Swiss Confederacy, becoming one of the "eight cantons" of the formative period of 1353 to 1481. Bern invaded and conquered Aargau in 1415 and Vaud in 1536, as well as other smaller territories, there by becoming the largest city-state north of the Alps, by the 18th century comprising most of what is today the canton of Bern and the canton of Vaud. The city grew out towards the west of the boundaries of the peninsula formed by the River Aare. Initially, the Zytglogge tower marked the western boundary of the city from 1191 until 1256, when the Käfigturm took over this role until 1345, which, in turn, was then succeeded by the Christoffelturm (located close to today's railway station) until 1622. During the time of the Thirty Years' War two new fortifications, the so-called big and small Schanze (entrenchment), were built to protect the whole area of the peninsula. After a major blaze in 1405, the original wooden buildings were gradually replaced by half-timbered houses and later the sandstone buildings that came to be characteristic for the Old Town. Despite the waves of pestilence that hit Europe in the 14th century, the city continued to grow mainly due to immigration from the surrounding countryside. View of Bern from the ISS. North is down and the Old City is in the upper, left hand side. Bern lies on the Swiss plateau in the Canton of Bern, slightly west of the centre of Switzerland and 20 km (12 mi) north of the Bernese Alps. The countryside around Bern was formed by glaciers during the most recent Ice Age. The two mountains closest to Bern are the Gurten with a height of 864 m (2,835 ft) and the Bantiger with a height of 947 m (3,107 ft). The site of the old observatory in Bern is the point of origin of the CH1903 coordinate system at 46°57′08.66″N 7°26′22.50″E﻿ / ﻿46.9524056, 7.439583. Of the built up area, 3.6% consists of industrial buildings, 21.7% housing and other buildings, and 12.6% is devoted to transport infrastructure. Power and water infrastructure as well as other special developed areas made up 1.1% of the city, while another 6.0% consists of parks, green belts and sports fields. 32.8% of the total land area is heavily forested. Of the agricultural land, 14.3% is used for growing crops and 4.0% is designated to be used as pastures. The rivers and streams provide all the water in the municipality. Bern has a population (as of December 2010) of 133,920. As of 2010, 23.2% of the population are resident foreign nationals. Over the last 10 years (2000–2010) the population has changed at a rate of 0.6%. Migration accounted for 1.3%, while births and deaths accounted for −2.1%. As of 2003 the average price to rent an average apartment in Bern was 1108.92 Swiss francs (CHF) per month (US$890, £500, €710 approx. exchange rate from 2003). The average rate for a one room apartment was 619.82 CHF (US$500, £280, €400), a two-room apartment was about 879.36 CHF (US$700, £400, €560), a three-room apartment was about 1040.54 CHF (US$830, £470, €670) and a six or more room apartment cost an average of 2094.80 CHF (US$1680, £940, €1340). The average apartment price in Bern was 99.4% of the national average of 1116 CHF. The vacancy rate for the municipality, in 2010, was 0.45%. In the 2007 federal election the most popular party was the SPS which received 29.12% of the vote. The next three most popular parties were the Green Party (24.88%), the SVP (16.73%) and the FDP (15.7%). In the federal election, a total of 43,783 votes were cast, and the voter turnout was 51.5%. Shnit international shortfilmfestival shnit International Shortfilmfestival, held annually in the first week of October. 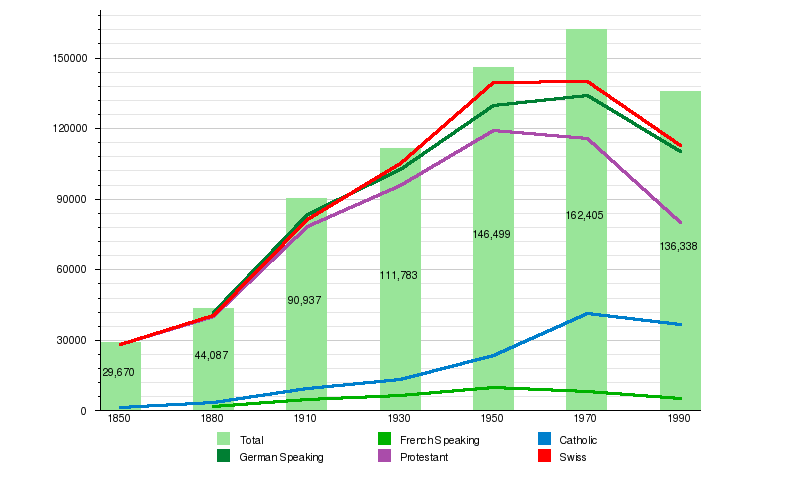 From the 2000 census, 60,455 or 47.0% belonged to the Swiss Reformed Church, while 31,510 or 24.5% were Roman Catholic. Of the rest of the population, there were 1,874 members of an Orthodox church (or about 1.46% of the population), there were 229 persons (or about 0.18% of the population) who belonged to the Christian Catholic Church, and there were 5,531 persons (or about 4.30% of the population) who belonged to another Christian church. There were 324 persons (or about 0.25% of the population) who were Jewish, and 4,907 (or about 3.81% of the population) who were Muslim. There were 629 persons who were Buddhist, 1,430 persons who were Hindu and 177 persons who belonged to another church. 16,363 (or about 12.72% of the population) belonged to no church, are agnostic or atheist, and 7,855 persons (or about 6.11% of the population) did not answer the question. Public transport works well in Bern, with the Bern S-Bahn, Bern tramway network, Bern trolleybus system and a bus network forming an integrated all-four style scheme connecting the different parts of the city. Bern railway station connects the city to the national and international railways network. Bern is also served by Bern Airport, located outside the city near the town of Belp. The regional airport, colloquially called Bern-Belp or Belpmoos, is connected to several European cities. Additionally Zürich Airport, Geneva Airport and EuroAirport Basel-Mulhouse-Freiburg also serve as international gateways, all reachable within two hours by car or train from Bern. Emil Theodor Kocher, recipient of 1909 Nobel Prize. ^ "Stadt Bern – Aktuelles" (in German). City of Berne. http://www.bern.ch/leben_in_bern/stadt/statistik/in_kuerze. Retrieved 2014-04-15. ^ "Eidgenössische Volkszählung: Bevölkerungsentwicklung in Stadt und erweiterter Agglomeration Bern" (in German) (PDF) (press information). City of Berne. 2003-01-17. http://www.bern.ch/leben_in_bern/stadt/statistik/volkszaehlung/bevoelkerung/downloads/MM0120031.pdf/download. Retrieved 2014-04-15. ^ "Office fédéral du développement territorial ARE – B3: Les aires métropolitaines" (in French, German, or Italian) (PDF). Federal Office for Spatial Development ARE. 7 June 2006. p. 4. http://www.are.admin.ch/themen/agglomeration/00641/03373/index.html?lang=fr. Retrieved 2014-04-17. ^ "''Quality of Living global city rankings – Mercer survey''". Mercer.com. http://www.mercer.com/referencecontent.htm?idContent=1173105#Top_50_cities:_Quality_of_living. Retrieved 26 October 2012. ^ "Climate Normals Bern/Zollikofen 1981–2010". Climate diagrams and normals from Swiss measuring stations. Federal Office of Meteorology and Climatology (MeteoSwiss). http://www.meteoswiss.admin.ch/files/kd/climsheet/en/BER_norm8110.pdf. Retrieved 21 January 2013. ^ "Stadttheater Bern". http://www.stadttheaterbern.ch/. Retrieved 12 April 2009. ^ "Narrenpack Theatre Bern". http://www.narrenpack.ch/. Retrieved 12 April 2009. ^ "Schlachthaus Theatre Bern". http://www.schlachthaus.ch/. Retrieved 12 April 2009. ^ "Das Theatre an der Effingerstrasse". http://www.dastheater-effingerstr.ch/. Retrieved 12 April 2009. ^ "Theater am Käfigturm". http://www.theater-am-kaefigturm.ch/. Retrieved 12 April 2009. ^ EDK/CDIP/IDES (2010). ﻿Kantonale Schulstrukturen in der Schweiz und im Fürstentum Liechtenstein / Structures Scolaires Cantonales en Suisse et Dans la Principauté du Liechtenstein﻿ (Report). http://edudoc.ch/record/35128/files/Schulsystem_alle.pdf. Retrieved 24 June 2010. ^ "EURO 2008 – Partnerschaft von Stadt und Kanton Bern sowie mit Stadt und Land Salzburg" (in German). Abteilung Kommunikation und Amt für Information, City of Berne. 2006-05-30. http://www.bern.ch/mediencenter/aktuell_ptk_sta/2006-05-salzburg?searchterm=partnerschaft. Retrieved 2014-04-06. GIS City of Bern at the Wayback Machine (archived October 23, 2007). This page uses content from the English language Wikipedia. The original content was at Bern. The list of authors can be seen in the page history. As with this Familypedia wiki, the content of Wikipedia is available under the Creative Commons License.